Skittels or 9 Pins is an old English Pub game similar to modern day bowling. There are many different versions of skittle sets and I was inspired to make my own Tramp Art version after looking at dozens of antique sets. This version is contained in an actual wooden cigar box. The tray inside is covered with vintage "Holly" paper. 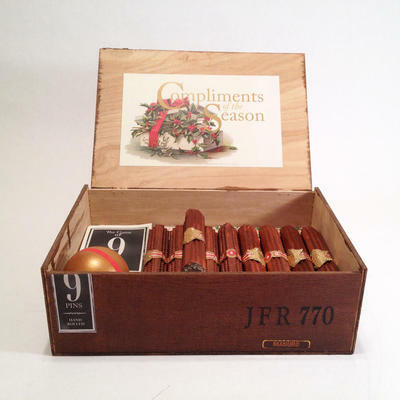 The set consists of a wooden ball and 9 Pins/Cigars. Each Pin/Cigar is stained, the ashes are painted and then dipped in to genuine German Silver Glass Glitter that will tarnish with age. The cigar bands are all vintage and each cigar has its own number from 1 to 9. I used Dresden Stars on each band and also placed one on the outside of the box. The exterior and interior labels are reproductions of vintage pieces in my collection. Each cigar is made using 10 handout and chip carved pieces of wood.